I was planning to post a recipe for, you know, real food, no dessert/breakfast food, but this recipe actually came about out of necessity. My parents rolled into Boston Sunday with 1. boots which I mistakenly packed when I was moving locations. I can’t be in fall-like weather without boots, obviously! 2. a brown bag full of peaches fresh from my Dad’s trees. I’ve been waiting FOR-EVER for fresh fruit from my Dad’s trees and 3. pudding shots. Yeap, my mom made pudding shots for a concert and I got the extras. But not just any pudding shots- cupcake pudding shots. Let’s just say I’ve been having “shots” of cake vodka at really weird times of the day and it’s been glorious! But back to the peaches! So, back in the day when I was in 1st-grade-ish and we were living in MA, my Dad planted some apple trees and I was stoked! Even at 1st-grade-ish, I loved me some fresh picked apples. But then we moved. To a house on the golf course. Down south. There wasn’t any space for gardening and I was bummed. BUT, then we moved back up north and my Dad plopped a few more fruit trees in the ground and I was stoked all over again! “4 years”, he told me. “You’ll have fresh apples by the time you graduate high school”. Then, “well…ok. Definitely by the time you graduate college”. * I used 1/2 cup of peach jam that my mom’s friend, Lu, made with my Dad’s peaches. I have not tried the 1 peach pureed. Preheat oven to 300 degrees. Grease a cake pan and set aside. Combine the cornmeal, whole wheat flour, salt, baking powder, and baking soda in a large bowl. Stir until combined. Add in vanilla, apple cider vinegar, agave nectar, non dairy milk, and peach jam (or pureed peach). Stir until dry ingredients are combined with wet ingredients. Pour batter into greased cake pan. Arrange sliced peaches on the top. 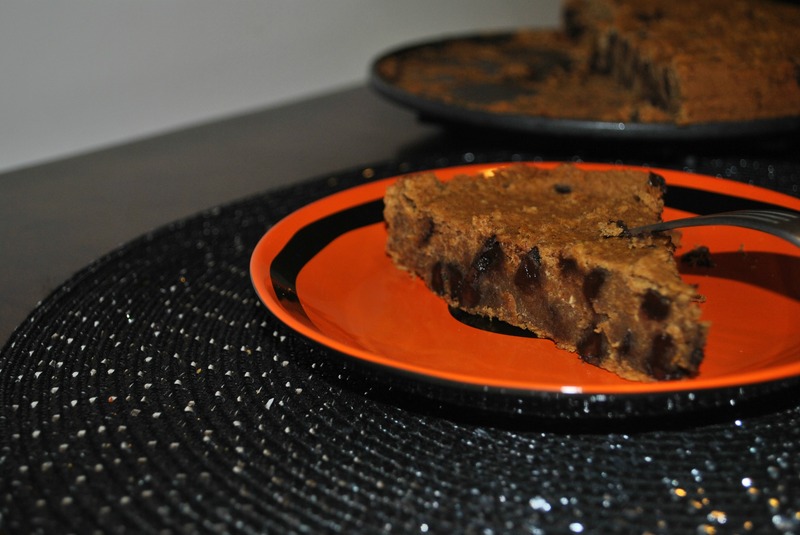 Bake for 30-45 minutes, or until knife inserted in center of cake comes out clean. Poke 10 holes in the top of the cake, scattered throughout. Combine brown sugar and coconut milk in small saucepan over medium heat. Continuously stir sugar mixture until brown sugar has dissolved. Pour glaze over cake. Store covered in refrigerator for up to 3 days. Yields 8 slices. I have to say, I was pleasantly surprised by this recipe. 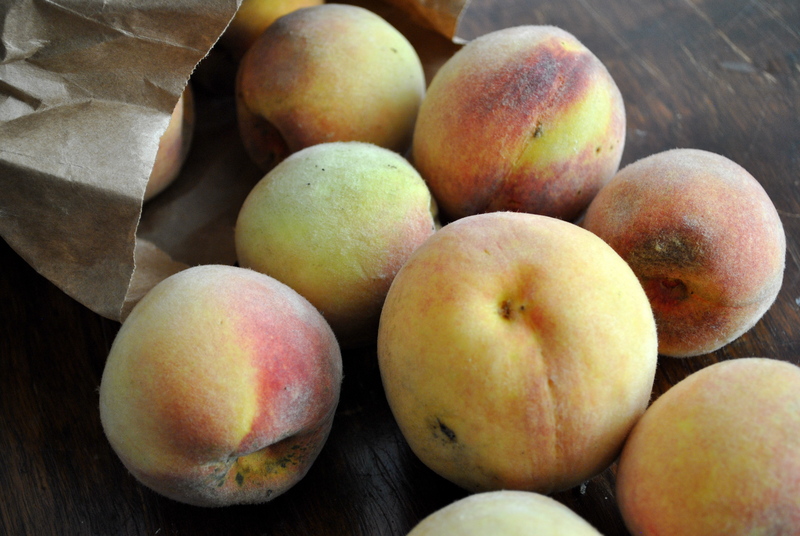 Cornbread and peaches are not two of my favorite foods and wouldn’t be something that I would normally choose to eat. This cake though is delicious. It’s not super sweet so you could definitely serve it along side your coffee or save it for dessert and serve it warm with some vanilla ice cream. 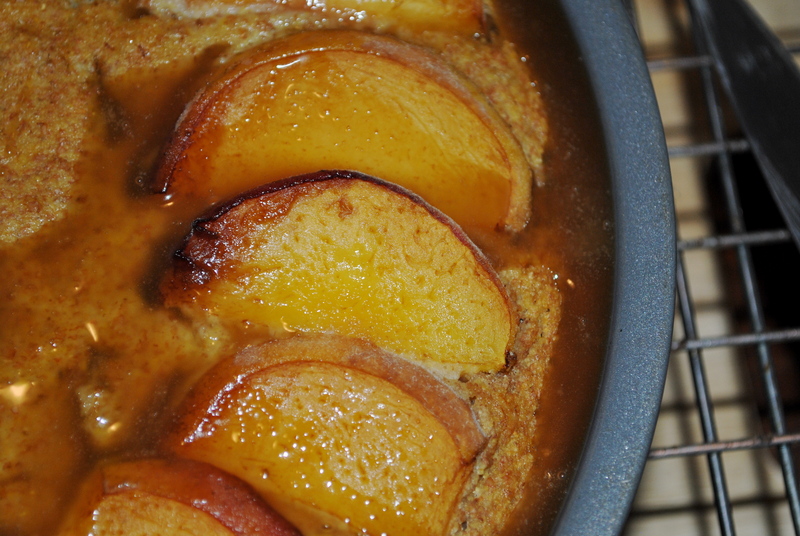 It’s very moist and the glaze on top is oh-my-gosh-I-could-eat-this-with-a-spoon good. I would recommend making extras and putting in on ice cream, or pancakes, or oatmeal, or french toast, or basically anything that allows you to consume it regularly. You won’t be sorry! 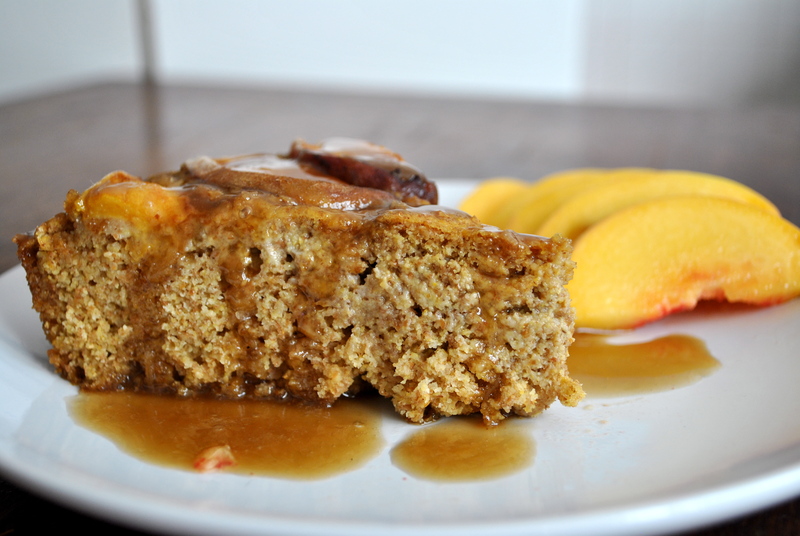 I know I’m making peach cakes this week but don’t be surprised if I start whipping out the fall recipes next week. You’ve been warned! Go, Go Wicked vegan, it’s your birthday. We’re gonna party like it’s your birthday. And you know we don’t give a F**k cause it’s your birthday! …sorry… that was unnecessary… but I mean, clearly I missed my calling as a rapper. Clearly! ANYWAYS. It’s Wicked Vegan’s 1 year birthday! You know… incase you didn’t get that from my rap above. I want to thank everyone who checked out my little blog this year. Every person who visited was SO appreciated. It makes me feel all warm and fuzzy knowing someone read my ramblings. 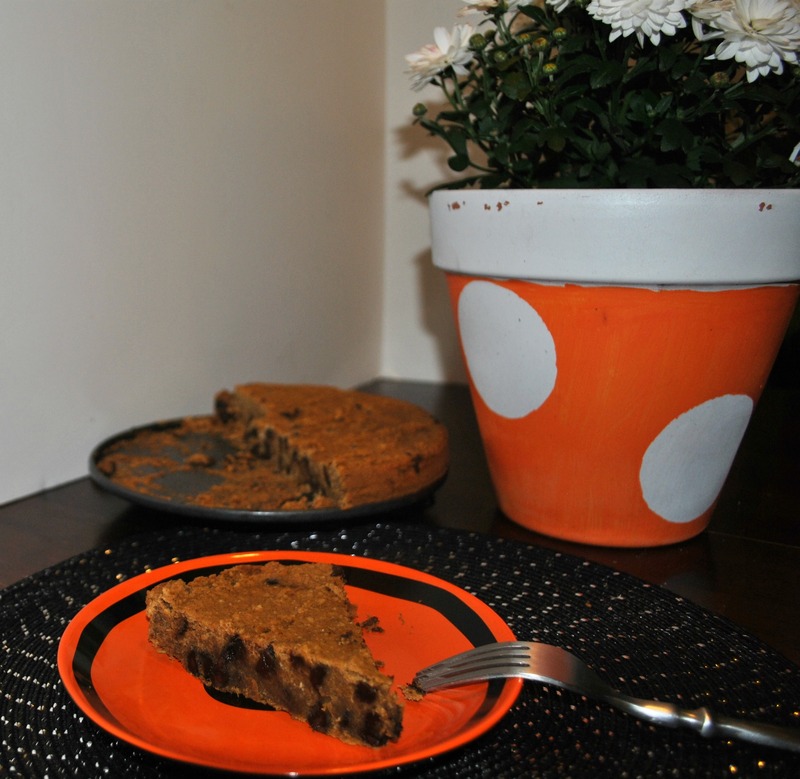 So to celebrate, I made this delicious autumn cake/cookie to share with you. Enjoy! Blend everything (except the chips) very well in a food processor (NOT a blender). Blend until it’s super-smooth. Mix in chips, and pour into a pan. (I used a 10-inch springform pan, but you can use a smaller pan if you want a really deep-dish pie.) Cook at 350F for 35 minutes. Let stand at least 10 minutes before removing from the pan. 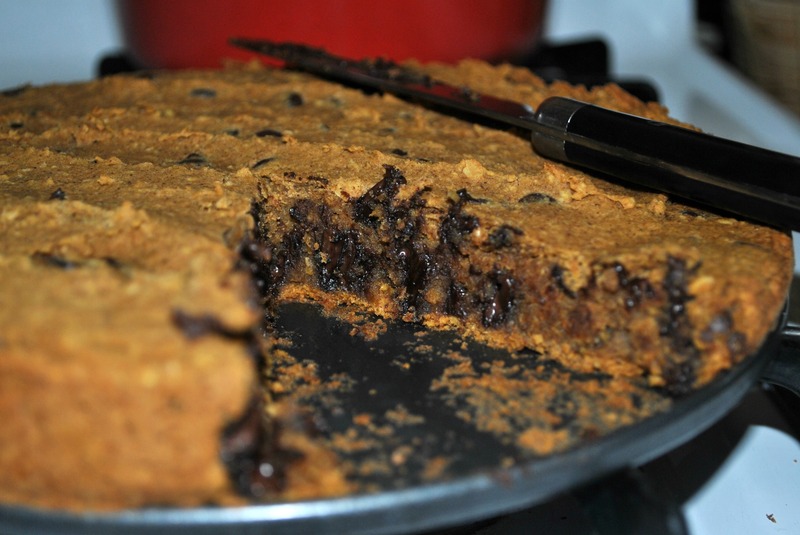 This recipe is very similar to the regular deep dish cookie cake , which as I said about 8 million times was delicious! 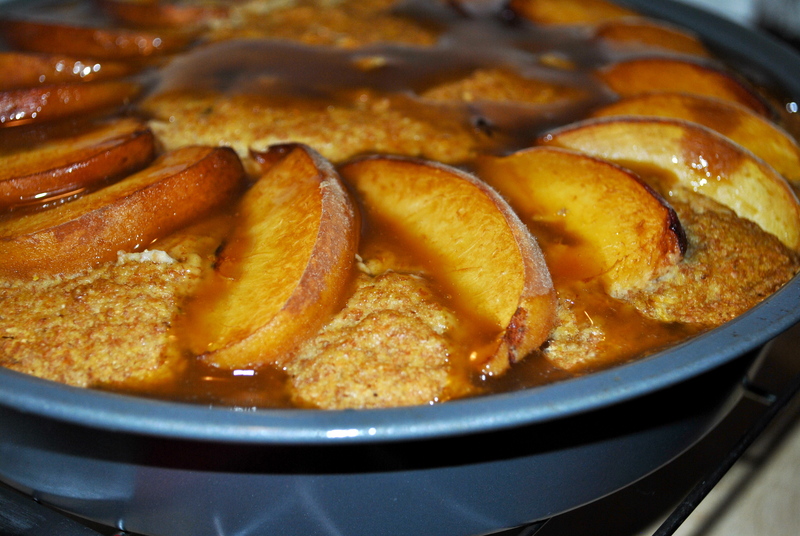 This version is just as delicious but with a a fall twist. And we all know that I LOVE a fall twist! Plus there is chocolate. And as I said in the last post, chocolate is must when you’re in a funk. mmmm…look how ooey, gooey that is above. 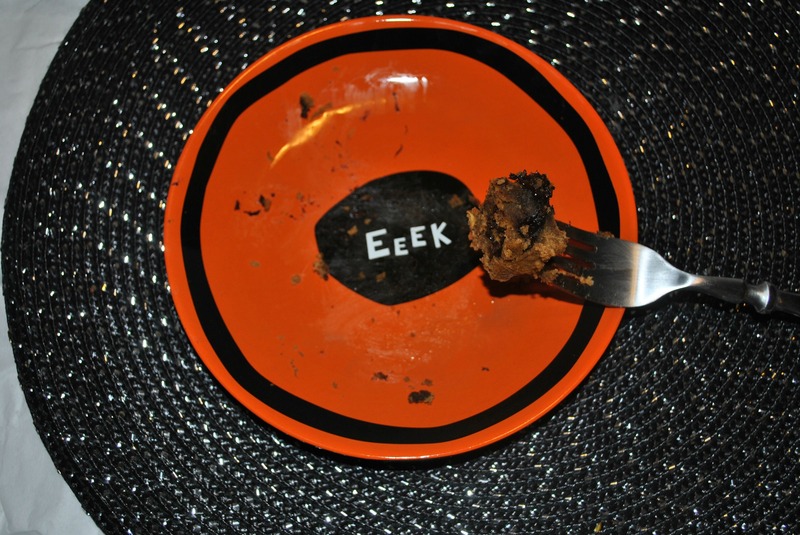 Look at me Eek plate. Isn’t it adorable? Keep an eye out for my upcoming rap CD. It’s called “White Vegan Girls Shouldn’t Rap”. 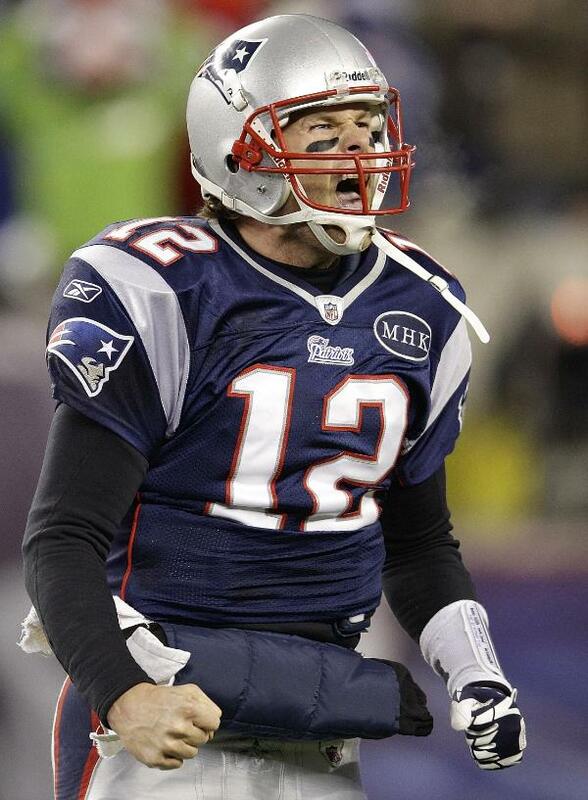 PATS ARE GOING TO THE SUPER BOWL!! I’m so excited! I can’t say it’s because of their stellar performance, though. Where the hell were their heads during that game? We have to give a special kudos to the Ravens’ kicker, Cundiff. Without him, who knows if we would have made it to the superbowl! And of course, my Dad’s man, Welker. Definitely caught a good portion of those catches. And he was all smiley the entire time. Love him! I’m sorry…I know not everyone is a football fan but we’re going to the super bowl! So in preparation for the game, I’m hoping that this week and next week I will be able to give you some recipes you can serve when you have all of your closest friends over for the game! Last week, I posted a BBQ chili recipe, which would be great if you are hosting. Its yummy enough for all your vegan and non-vegan friends a like. 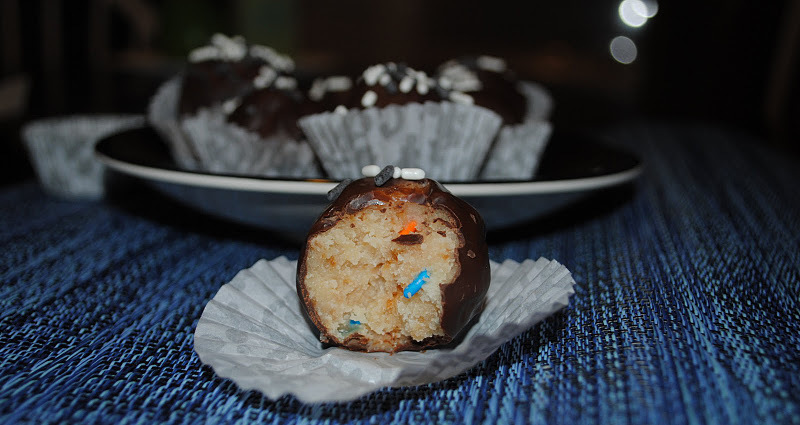 Today, I’m giving you funfetti cake balls. I was hoping to show you these last Friday but, er, I had some issues making them. For instance, I cooked the sprinkles into the cake my first time around and well, the cake balls turned out a lovely gray color. yeah…that doesn’t work for me. I want color in my cake! Cream butter and sugar in the bowl of an electric mixer until fluffy, about 3 minutes. Add “eggs” and vanilla and beat until combined. Combine dry ingredients in a bowl. Add half of the dry ingredients, mixing until just combined. Add the milk. Once mixed, add remaining dry ingredients. Bake in 9″ round pan for 30-35 minutes. Place the 1/8c. of condensed milk into a 1/2 c and fill the rest with Vanilla Soy milk. (This recipe is halved from the almond joy cake balls so the liquid ingredients are kind of wonky). Crumble the cooled cake into a large bowl. Add the vanilla soy milk and the condensed soy milk to the bowl. With your hands, mix the ingredients in the bowl together until they are well combined. Add the sprinkles in last and mix them well into the dough. Roll into balls and place on a baking sheet lined with parchment paper. Chill for 1 hour. Melt the chocolate and vegetable shortening in a double boiler on the stove. 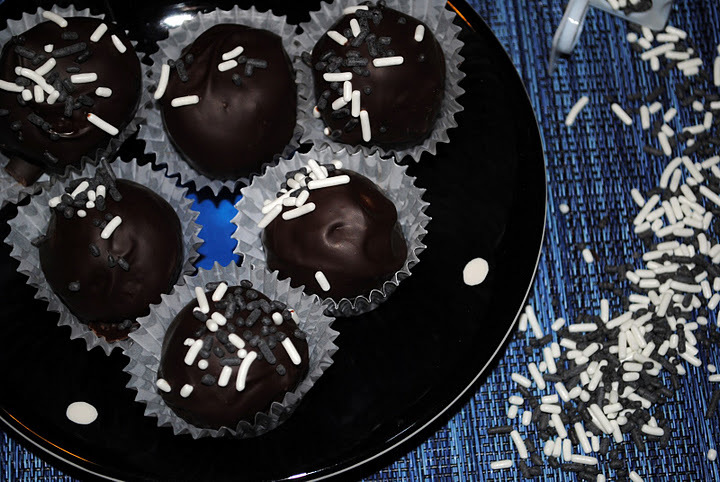 * Roll the chilled cake balls in melted chocolate and place back on the parchment paper. Return to the fridge until read to serve. *I used a decent amount of shortening in the chocolate because I really wanted to thin it out. The first batch I made, when the cake turned out gray, also had too much chocolate. The dark chocolate overwhelmed the cake so I wanted to just put a very thin coating on it. If you have vegan white chocolate, I would definitely advise using that. I haven’t been able to find any so I just used the semi-sweet. 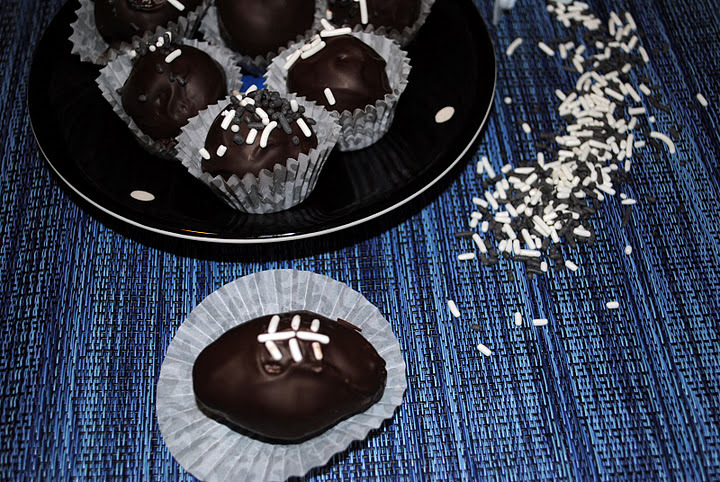 So you could make these into balls like I did above or, if you want to get super fancy for the superbowl, you can make them into footballs! Aren’t they so cute?! ok…I know…these aren’t the best footballs. I actually got this idea as I was rolling the cake calls out so there wasn’t a whole lot of preplanning involved, like 5 seconds of preplanning. If I did them again, I would probably pipe the stitching on so it looked cleaner but I worked with what I had at the time! If you aren’t trying to make these vegan, you could also use the Wilton’s colored chocolate discs they sell at Michaels and dunk these in Red or Blue for the Pats. If you use those, you won’t need the vegetable shortening. 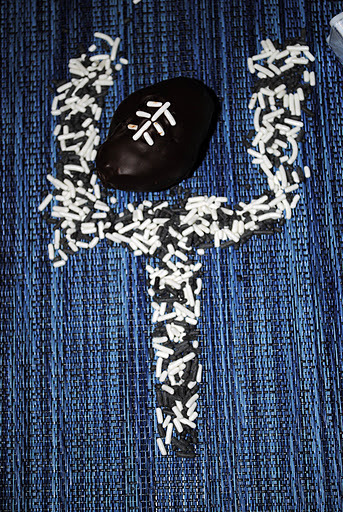 OR, if you could find red and blue sprinkles, you could do the sprinkles in Pats colors. That would actually be really cute while still staying vegan!